I don't know about you, but I have an obsession with Pinterest. I find so many great ideas and want to try all of them right away! I recently came across a picture of a pillow book holder. And what might this be you ask? It is a pillow you can use to rest your book on as you read. It is different from a regular pillow because it has elastic bands to hold the book in place and a ribbon to hold your page. This project is not only fun for adults but would be great for children too! It only took me about an hour from start to finish and you'll be snuggling up on the sofa with a good book and your pillow book holder! ** Have a book and/or magazine handy when starting this project. I based my pillow off of magazines because I read more magazines than books. 1) Cut two rectangles about 3" larger than the book/magazine you are replicating. Remember to measure 3" on ALL FOUR SIDES. My rectangle was 16x22". You may choose to make it smaller or larger depending on the size of the reading material. Keep in mind that because pillows curve as you get toward your seam, you don't want your magazine/book to curve with it. You want it to sit on top of your pillow. 2) Using one of your rectangles (face up), make a mark in the middle of the long side and pin the ribbon on both the top and bottom. Mark where you would like your elastic to go. 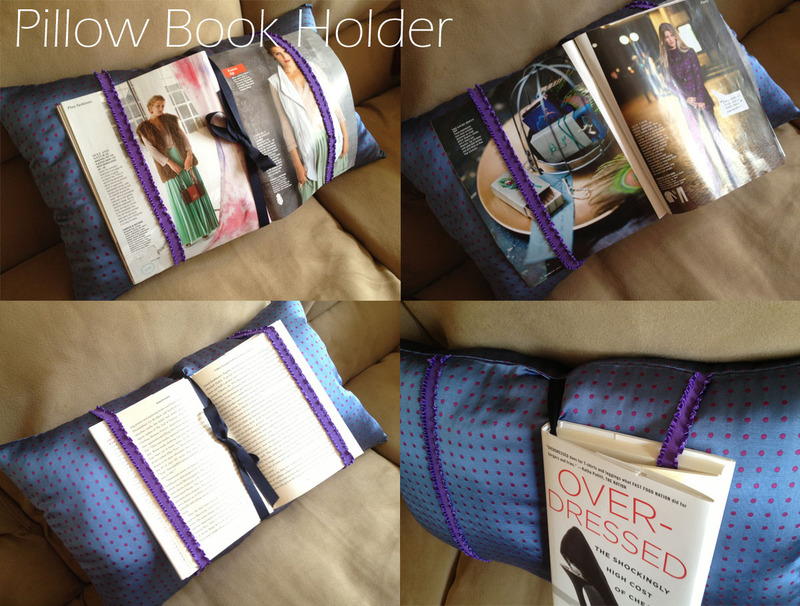 You may want to use your book as a guide so that when the pillow is finished, the elastic will hold your book in place. Cut the elastic 1" shorter than the pillow. You want the elastic to be taut so it can hold the pages in your book. Pin elastic in place. This is what the front of your pillow should look like. 3) Pin the other half of your pillow right sides together. 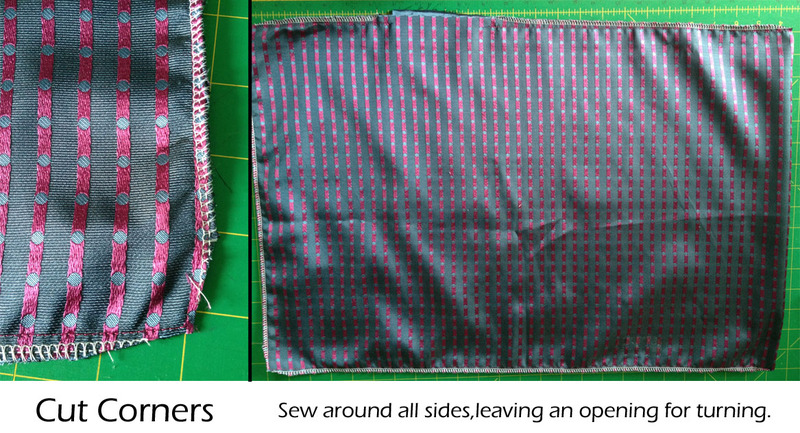 Sew all four sides, leaving an opening large enough to stuff you pillow. Cut corners and turn right sides out. Using a turning tool, carefully push the pillow corners out. 4) Stuff your pillow to the desired fullness. I like a decorative pillow to have a smooth, firm finish, so I used about 1 1/4 bags of fiberfill. Amount of fiberfill will vary depending on how big your pillow is. Hand sew the opening of your pillow closed. Voila! You have a complete pillow, ready to read an afternoon away! - To prevent your ribbon from fraying, you can burn the ends! This only works on polyester or nylon ribbons. Using a lighter, glide the ribbon end through the flame. Do not allow it to fully ignite, otherwise it will start to curl. I recommend doing this over a sink. Burn the ends before you attach them to your pillow! - So many different fabrics could be used for this project. You could try a beautiful brocade for an elegant look, fun cotton print to match your personality or how about a worsted wool or blend suiting for a traditional design.